Hudson News and gift shop has a wide selection for your needs: everything from daily newspapers to magazines of your choice, best-sellers both in hardbound and paperback, candy and snacks, plus a wide array of souvenirs and gift items. Hudson News can be found on both the first and second floor of the terminal. 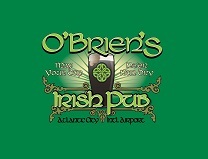 O'Brien's Pub & Grill offers Irish fare as well as American classics. They feature many craft beer's by the bottle or on draft. 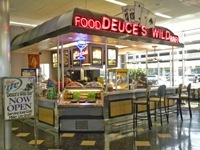 Deuce's Wild is a full-service bar that serves items that are made to order. Breakfast items include anything from coffee and Danish to customized omelets and breakfast sandwiches. It's lunch and dinner menus include burgers and sandwiches hot off the Panini Press, garden and chef salads, and a selection of beverages. The refurbished restaurant bar is located on the first floor of the terminal lobby and stands ready at 5 a.m. to serve your needs. Located on the second floor of the terminal, offers quick-serve, made-to-order services to passengers who have cleared screening. Open at 5 a.m., Thrashers offers anything from gourmet bagels and orange juice, to delicious breakfast sandwiches and platters. The restaurant’s lunch menu expands to include both hot and cold sandwiches, snacks, and a selection of beer and other beverages. Euro Cafe / Hudson News combination is located upstairs in the terminal and is the perfect place to grab a tasty bite, a great cup of coffee or a magazine to read - all in one great place. Enjoy gourmet coffees, teas, lattes, frappes and cappuccinos, and a wide selection of mouth-watering baked goods and treats. Automated Teller Machines are conveniently located on the first and second floors of the terminal.